20th June, 2013 © blanket sin – "hst"
This is where I ramble so that I envision what my drawring looks like against a blog of text. Tomorrow I'll be trying out a pub for the first time. I'm having some reservations because it is in downtown and the parking situation is going to be a mystery to me. Before I get around doing that, I have some shopping in mind. I'm trying to put together a small little gift set consisting of a mug (for coffee) and candy/toys. Not toys per se, but more like office supplies. A pencil sharpener, a pencil, etc. I still consider these things toys because just look at how I spend down time at work when the phone isn't ringing. I love this part. Unfortunately, it is during this customer service part of my job that a disgruntled customer can ruin my whole day in the blink of an eye. Why the frog? If I knew how to draw an owl, it would've been a some sort of bird of prey. This kind of doodling I do up here, in the public eye, is required to be, by definition, stupid and unimportant because when a customer arrives, I have to drop what I'm doing and feel comfortable taking notes on the sheet of paper in front of me. That means, this little froggy could've met with a lacking leg, or improper shading. 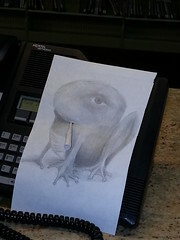 Funny how I began shading with a rolled up paper to blend in the pencil strokes and in the end, I poked a hole in the frog's mouth to hold the paper. I think it added some character, having destroyed my drawring this way. It reminds me of the picture of my bedroom where I'm sleeping which I uploaded in the profile of my lj blog but had all but crumpled it up and tossed in the trash before it ever got scanned. Love your description of the frog. All my art has holes poked through it. Oh and I love the frog too. Thanks. We're scheduled to work the public service desk an average of 2 hours at a time, twice a day. I think I'll be coming out with other bizarre looking creatures in the future.